You are a For Sale By Owner with all the power of the MLS behind you. Employ over 6000+ Realtors by advertising on Maine Listings Service (MLS). Receive all required legal disclosures and paperwork. Write your own advertising remarks. Set up your own showings to accommodate your schedule. Negotiate directly with the Buyer’s Realtor. Decide how much you will pay the Buyer’s Realtor in commissions. Save ½ of the traditional commission costs. List your home until it sells. Free re-listing contracts. Pay with a credit card or certified bank check at the time of contract signing. NO REFUNDS. With advice, this listing will convert to a traditional 6% listing. All new paperwork will be required by the seller. 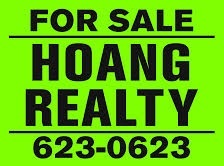 A Hoang Realty Realtor will take on all of the liability, negotiations and get this sale to closing. Seller will receive a credit at closing for $300 from the MLS Only initial listing.